Marco Rubio should drop out of the presidential race before being humiliated next week in his home state of Florida. A March 7 Quinnipiac poll shows him losing by an enormous 23 points to frontrunner Donald Trump and ahead of Texas Sen. Ted Cruz by only 4 points in the Sunshine State. So far, Rubio has lost 22 out of 23 states, picked up zero delegates in the four March 8 contests, and now is clawing to avoid fourth place everywhere. Often finishing in single digits, it’s time for Marco to admit that he’s a candidate with no significant base of voter support who is not going to win the presidency in 2016. The very junior senator from Florida says he’s sticking in the race until he can ostensibly turn it around in Florida’s primary on March 15, and his supporters still claim he has a chance to win the nomination is a brokered convention. But even if it comes to that, Republican Convention Rule No. 40 states that a candidate must have won at least eight states to be selected as the party’s nominee; Marco has only won a single one, liberal Minnesota, which has not voted for the GOP for president since 1972. Even if the party establishment decided to change the rules to deny the nomination to Mr. Trump or Sen. Cruz, why would Republicans choose a standard-bearer such as Rubio who has proven he cannot win almost anywhere? Similar to his double-digit deficit at home in Florida, Rubio is in single digits, stuck in fourth place, and losing by 29 points in Ohio, a state every Republican since Lincoln in 1860 has had to win to become president. Rubio is also losing in every other state next week, including Illinois and North Carolina, where he’s down to Trump by 11 and a whopping 27 points respectively. So much for Marcomentum. That last tweet hits the nail on the head. It is not Rubio’s time, no matter how much hack consultants try to argue that the guy who can’t win consistently in the primaries is somehow the only GOP candidate who could beat Hillary Clinton in the general election. And at this point, Rubio’s brand value is so diminished that it’s doubtful that he would offer any remaining candidate any benefit from partnering with him. The Floridian’s fundamental problem is too many Republicans think Rubio can sound articulate enough but worry that he’s an empty suit. After all, he’s been running for one public office after another since he was 26 years old, yet his biggest accomplishment seems to be marrying a Miami Dolphins cheerleader. That’s not going to cut it in 2016 when voter anger with career politicians is the dominant mood of the election. 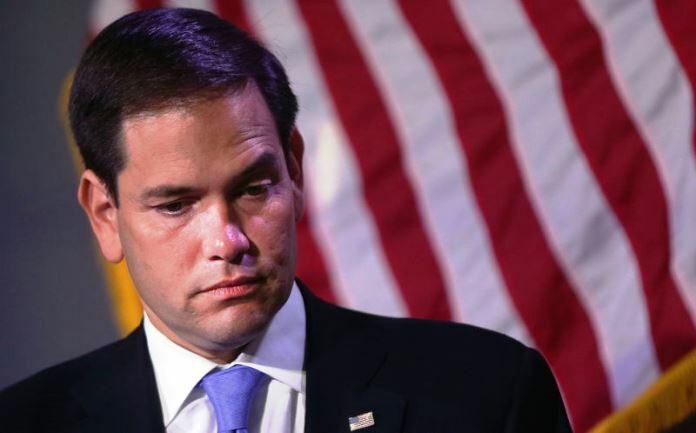 With no path to victory, Rubio should quit. Brett M. Decker is a former editor for the Wall Street Journal and editorial page editor of the Washington Times. Follow him on Twitter @BrettMDecker. A different version of this article appeared in the Daily Caller.